Windows users may want to read this guide to learn how to partition Windows PC hard drive without formatting data. 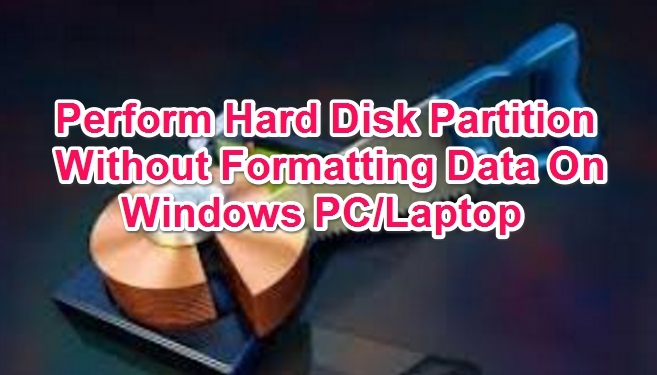 Biggest inconvenience when it comes to creating hard drive partition is that it mostly requires formatting data, which you need to restore once the process is complete. But now there is a solution that allows you to partition hard disk and you don’t need to format it. Read the instruction below to know how to do it. This solution is going to be of great help to Windows 10, 7, 8, 8.1 PC users who want to partition a hard disk without formatting data saved on it. When you install a new copy of Windows OS it asks you to partition hard drives on PC to allot desired disk space to each drive, but it also requires you to format existing data from disks for re-partition. In this tutorial, we are going to explain a simple method using which you will be able to create hard disk partition to increase/decrease the available space on available drives on your Windows PC without Formatting the disk. Windows PC users often use different partition sizes for hard drives available on their computers to save files and data according to personal preferences. You will rarely find two PC Windows users have similar hard disk partition as it is a matter of personal choice. When you purchase a new Windows PC, it mostly contains one large drive with all available disk space. For example, it your device comes with a 256GB hard disk but you want to create another disk for save media files and personal folders and keep them separate from systems files, then you need to create a new drive with let’s say 100 GB space. This way you will have two drives on your system; one for main system and important program files and the other for media and personal files and folders. So, let’s see how to create a hard disk partition without formatting. Step 1 – Click Start icon. Step 2 – Type disk mgmt.msg and hit enter key to open a Disk Management window. Step 3 – On Disk Management window you will see all system drives. Select the drive whose space who wish to extend or decrease. For shrinking space and create a new drive, make sure that drive has some free space available on it. Step 4 – Right-click on the drive letter you want to shrink or get some space from. Select shrink volume from the contextual menu. Step 5 – A new box will open in which you will the information about the current size of the drive, free space and size available shrink space. Enter the amount space you want to free, make sure size remains less than the available shrink space, and hit the Shrink button. Step 6 – In the disk management window, you will an unallocated space at the bottom right corner. Right-click on it and select New Simple Volume from the context menu. Step 7 – This will take you to a New Simple Volume Wizard window to create a partition. Hit Next button on it. Step 8 – Now you need to enter the volume size and hit next. Step 9 – Next give a new drive a letter or name from the drop-down box and hit next button. Step 10 – On the ‘Format Partition’ page, select the file system as NTFS or FTS, whichever applies to your device’s file system, and then enter the name in the ‘Volume Label’ box and then hit next button. Step 11 – This will start the formatting process and hit Finish when complete. Step 12 – All done! Similarly, you can increase the hard disk space of the drive which gets filled up by files and folders. In the case, follow the above space and shrink space from a drive having extra space and allot it to the one which requires more space. And that is how you can partition a hard drive on PC without formatting data saved in them. One more thing to note that creating more than 5 or 6 partitions can corrupt Windows OS and result in serious performance issues. Also, if you only have one partition all data will be lost if you install a new OS, so keep a backup of important before performing a new Windows installation.